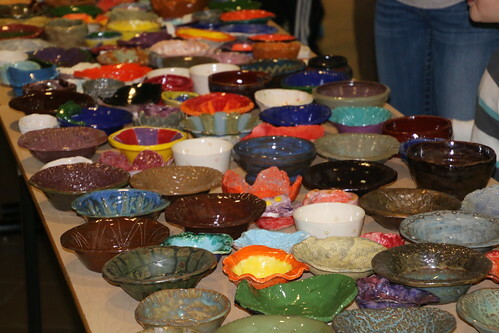 The Sixth Annual Empty Bowls Project on Thursday February 4, 2016 at Saline (Michigan) High School. This fundraiser for Food Gatherers of Washtenaw County was an evening of food, entertainment and community as we celebrate an opportunity to help end hunger! Participants enjoyed a bowl of soup, fresh bread, beverage and dessert prepared by the Culinary Arts Students at Saline High School. Musicians at Saline High School and Saline Middle School provided the entertainment. They also got to take home a handmade ceramic bowl created by Saline Area Schools Art Students (grades 3-12) in celebration of the project. This is a great fundraiser that brings attention to hunger in our own community. The easiest fat loss product on the market. 250 fat torching recipes to banish your boring diet and burn fat faster! Click Here for more information!